The 5 liter can, for the grand olive oil lover. Our extra virgin olive oil is unfiltered, cold-pressed, and organic. 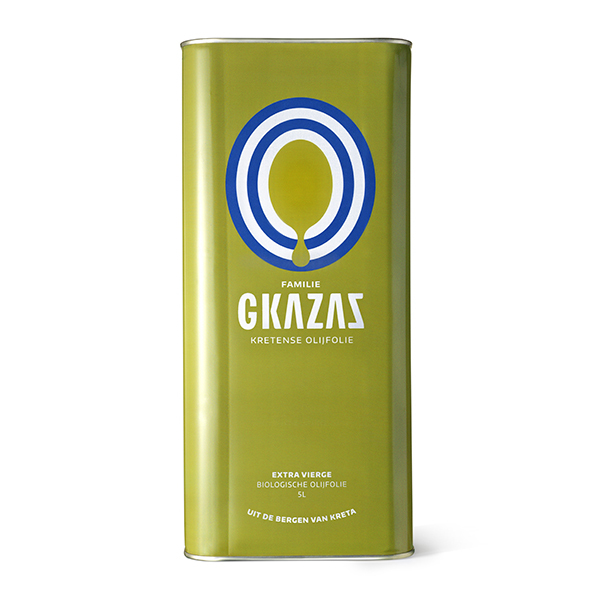 Furthermore, Gkazas is not mixed with other oils and free of other additives. Nature at its finest! For the power user! Did you know that the ‘authentic’ Greek consumes 30 liters of olive oil per person per year on average? Us Dutchies ‘only’ consume about 1 liter a year on average. This 5 liter can extra virgin olive oil doesn’t only look awesome but is also a great encouragement to start cooking with olive oil and taking on the Greek lifestyle. Another big plus is that Gkazas is an honest family product. The olive oil is produced with our own hands on the mountains of Crete. The same goes for the harvesting and pressing of our Greek olive oil. We fill the cans with much love close by our olive groves and then transport them to the Netherlands. An authentic Cretan product!